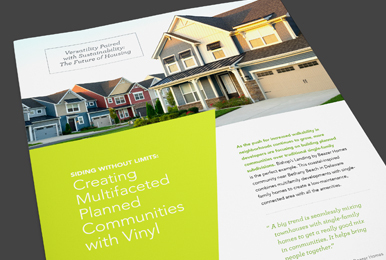 Home › Blog › The Case for Vinyl Siding’s Eco-Friendly Benefits Gets Stronger. We all might recall the old adage “Dead men tell no tales.” For the Vinyl Siding Institute (VSI) and its members, when it comes to asserting their products’ green advantages, they believe that FACTS & SCIENCE tell no lies. A recent BEES report was published that shows vinyl siding having a better Environmental Impact Score (EIS) than other exterior products. To recap from my first blog, BEES (Building for Environmental and Economic Sustainability) is a software-based life cycle analysis tool developed by the Federal Government’s National Institute of Standards and Technology (NIST). It continues to be operated and provided by NIST, and one of the tests for the Life Cycle Analysis is conducted by the US EPA Science Advisory Board. The BEES tool is a key resource for VSI’s Sustainability Work Group mission of using FACTS & SCIENCE to demonstrate vinyl siding’s eco-friendly benefits in relation to other exteriors. The BEES Product Comparisons study analyzes eleven impact categories to help us better understand where vinyl siding measures up with the other claddings in terms of their effects on climate change and the overall environment. In the first part of this report, the BEES was used to do average unit comparisons of vinyl siding and insulated vinyl siding with cedar board, fiber cement, and generic brick and mortar. Vinyl siding has lower impacts than cedar board in the ozone depletion, smog, global warming, acidification[i], eutrophication[ii], and non-carcinogenic[iii] impact categories. The impact category with the most favorable performance for vinyl siding is the eutrophication category, where impacts are only 13% of those for cedar board. Cedar Board is more than twice as high as vinyl siding when it comes to ozone depletion, and Cedar Board has a 42% higher smog impact than vinyl siding. Insulated vinyl siding has lower impacts than cedar board in the ozone depletion, smog, and eutrophication categories, with eutrophication again being the category with the best performance as impacts are only 14% of those for cedar board. Vinyl siding and insulated vinyl siding have SIGNIFICANTLY lower impacts than fiber cement in every environmental impact category. 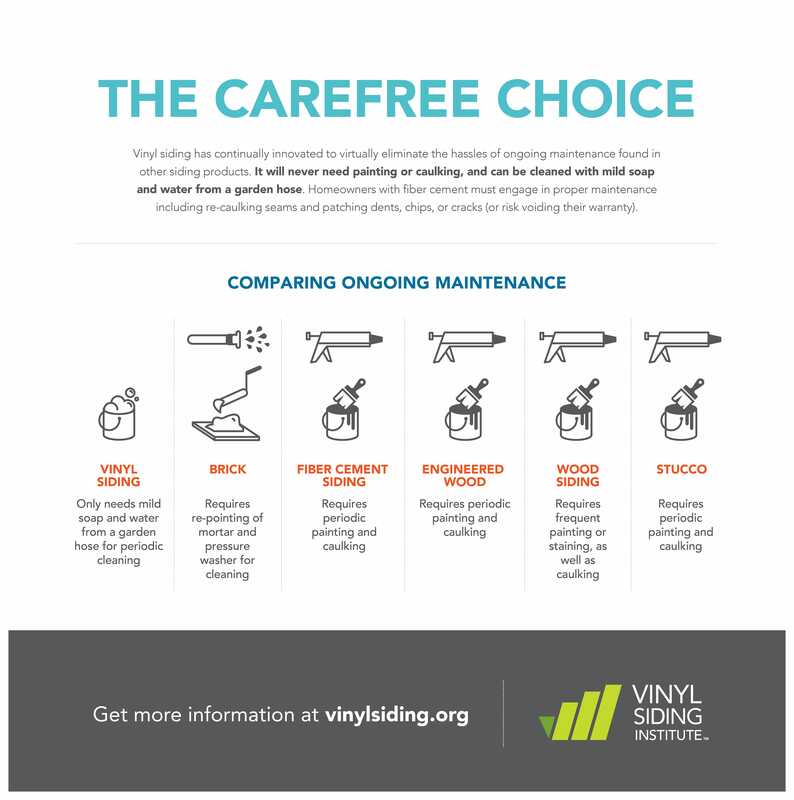 The impact category with the most favorable performance for both forms of vinyl siding is the non-carcinogenic category, where impacts are only 1% of those for fiber cement. In addition, average vinyl siding is only 19% of average fiber cement’s ozone depletion impact, and only 21% of fiber cement’s global warming impact. Compared to average brick and mortar, both vinyl siding and insulated vinyl siding have lower impacts in all but one of the categories (Primary Energy Demand – Renewable). The impact category with the best performance is smog, where impacts are only 11% and 15% respectively of those for brick and mortar. The results of these individual product unit comparisons are quite significant in demonstrating vinyl siding’s greener advantages, especially in key categories that impact climate change. Combined environmental impact scores (EIS) show vinyl siding is way ahead of the competition. Using the BEES tool, the US EPA Science Advisory Board’s impact normalization methodology shows vinyl siding to have a more favorable rating versus fiber cement and generic brick and mortar. The combined EIS for brick and mortar is 330% of the EIS for the same area of vinyl siding, and 288% for the same area of insulated vinyl siding. The EIS for fiber cement is 965% of the EIS for the same area of vinyl siding, and 841% of the EIS for the same area of average insulated vinyl siding. Utilizing the BEES Stakeholder Panel impact normalization methodology, vinyl siding has a lower EIS compared to both brick and mortar and cement per unit area. The combined EIS for generic brick and mortar is 356% the EIS for the same area of average vinyl siding, while the EIS for fiber cement is 997% the EIS for the same area of average vinyl siding. The combined EIS for generic brick and mortar is 312% the EIS for the same area of average insulated vinyl siding, while the EIS for fiber cement is 875% the EIS for the same area of average insulated vinyl siding. The combined Environmental Impact Scores (EIS) will perhaps be a revelation to many in the green building movement who have dismissed vinyl siding as a mere plastic, without really taking the time to understand its greener benefits. This is why the vinyl siding industry is making a strong investment in these research initiatives and working closely with the NIST and the US EPA Science Advisory Board. They have made a commitment to improving its eco-friendly assets, and are not afraid to use FACTS & SCIENCE to track its performance compared to the competition. While the industry takes great pride in the progress its manufacturers have taken collectively to improve vinyl siding’s performance in relation to its impact on the environment, the leaders and key stakeholders are working hard to further minimize their products’ effects on climate change. This is evidenced by the third component of this study, which includes a comparison of the environmental impact of vinyl siding in 2012 v. 2016. 2016 average vinyl siding has lower impacts in the global warming, smog, acidification, eutrophication, and non-carcinogenic impact categories. The largest improvement was in the eutrophication category where 2016 impacts are 63 % of 2012 impacts. 2016 insulated vinyl siding has lower impacts in the global warming, smog, acidification, and eutrophication impact categories compared to 2012. The largest improvement was in the smog category where 2016 impacts are 61% of 2012 impacts. Based on 2012 comparisons, there is still more work to be done in the ozone depletion, carcinogenic, non-carcinogenic, respiratory effects, and ecotoxicity impact categories. But as this latest BEES report indicates – especially with regard to the combined EIS ratings, vinyl siding’s only real competition in reducing environmental impact is itself. And as the industry’s commitment to greater eco-friendliness has demonstrated for several years now, you can expect to see continuous improvements in performance across all impact categories. [i] Acidification is the act or process of making something acidic. It affects air quality and climate change. Ocean acidification, in particular, threatens species that are vital to the marine ecosystem. [ii] Eutrophication is excessive richness of nutrients in a lake or other body of water, frequently due to runoff from the land, which causes a dense growth of plant life and death of animal life from lack of oxygen. [iii] Non-carcinogenic describes those substances or agents that are not known to cause cancer, but are studied to determine health and environmental impacts. Don Browne is a writer and entrepreneur who believes that the power of words can change the world. He provides unique writing services for clients in the construction, health care, IT and hospitality sectors. He has a passion for small business and start-ups, as well as writing about Irish history, family and corporate biographies. As a homeowner and father of four, Don looks forward to writing more about sustainability issues within the housing industry.